In the 1940s, ‘50s and ‘60s, every kid in town knew her as Mrs. Newsy, and she knew each and everyone of them by their first names. Most of the young people came to the Newsy Nook to buy candy, gum, popcorn, pop, ice cream, novelties, and the very popular comic books. In the almost twenty-five years she worked there she saw children grow up and go to college and even marry and become parents, and bring their children in to see her. The children were a very big part of the business of the little store that was located north of the Post Office, and a couple doors south of the theater but she also knew many of their parents and grandparents who came to buy magazines and cigarettes, tobacco and newspapers. She was a tiny dark haired woman born Dorothy Maude Jackman in Southampton, England. She was so very tiny when she was born that the family called her Dolly. As she grew to a teenager, her friends called her Phyllis for some reason that she never could explain. In 1918, she met and married Roy H. Wagner, a Chief Petty Officer in the US Navy who was from the Sand Hills of Nebraska. She liked to tell about their wedding; about the black horses that pulled the coach they rode in and the white ribbons decorating the horses. The small amount of sugar Roy was able to get from the Navy just for their wedding reception was a highlight at a time when sugar was very scarce. Following World War I, Roy had to return to the United States on his ship but she followed on the next one and he met her in New York. They had the long train trip from New York to Comstock, Nebraska where his parents lived on a farm. Phyllis was shocked at the distance they had to travel because in England it didn’t take more than a day to go any place in the country. Living in a three room farm home with his parents for a short while was a new experience for her. She had lived in a large home in England where almost everything had been done for her. They soon moved to Chadron and Roy returned to work on the railroad where he had been before the interruption by the War. They rented a light-house-keeping room above the variety store owned by Mrs. Cockrel, where MarBow Archery and Music store is now, and that is where their daughter, Goldie was born. When Goldie was five weeks old they had to move to Hot Springs, SD, where Roy was sent by the C & NW Railroad. They lived there two years and liked it very much. They had two bad experiences while they were there. One night there was a terrible lightning and thunder storm. Phyllis was very frightened and sat in their apartment over a drug store holding Goldie all night because Roy was out of town. She said, “The lightning was non-stop. It lighted up the room bright enough to read a newspaper.” The rain came down like the bottom had dropped out of everything. The next day they learned that the railroad track had been washed out and the big wall along River Street had been washed out. If you look over the side of the present wall you can still see part of that wall lying along the bank. The other bad experience came because there was an epidemic of Scarlet Fever and they attended a funeral of a friend who died. Shortly after that, Phyllis became very seriously ill with the disease and she, Roy and Goldie were quarantined in their apartment. A neighbor brought food to the door for them. After that crisis they returned to Chadron and lived in an apartment above the Hoke Grocery store for a while. Roy bought a small home in the one hundred block of Morehead that had been the town’s original jail. He fixed it up and they were very comfortable there. They then bought a home at 520 Shelton Street which he painted and fixed up. They moved there and rented the small house to some other people. The Depression came along and Roy was laid off of his job. He took several different jobs and Phyllis went to work for the Blaine Hotel as a chambermaid in an effort to make ends meet in those hard times. The Donahues owned the hotel and Al and Ward Dandridge, better known as Ganz, worked for them. Phyllis discovered she could make beautiful light angel food cakes. She entered one in the Dawes County Fair and won first prize and when the word was out that she made such lovely cakes there became a big demand for them so she made and sold them for one dollar. She bought a cake decorating set with all the proper nozzles to make flowers and this made her business even better. She won first prize at the fair for her cake decorating so many times, that other women complained they could not compete with her and she stopped entering them. Now it can be told that Roy often did the decorating. He enjoyed it and was good at it. Roy leased the Standard Oil Station on the corner of First and Main Streets, across the street from Barney Lecher’s station. He also drove the tank wagon to call on farmers to sell fuel to them. Roy was getting a little more work and of course Phyllis was staying home. Goldie was in school at the Prep and all was going better. The veterans of World War I were trying to get a bonus that had been promised to them by the government and with the Depression times they could all use it. They lost their home on Shelton Street and also the little one on Morehead. Many people were in the same boat. They then rented a home at 437 Chapin Street and later bought it. Goldie eventually graduated from the Prep and married Leo Dawkins that same summer. That was the year the bonus was paid to the veterans. Roy and Phyllis bought a new Willy automobile. They were selling for something like $500. They had gotten through the Depression without the help of the bonus and they were needing a different car so why not buy a new one? Goldie’s husband went to work for the Federal Government as an electronic technician, later being drafted into the army in World War II, doing the same work. They did a lot of traveling, eventually living in San Francisco, CA. Mean time, back in Chadron, Jack was going to school at the Prep, Roy was getting steady work on the C & NW Railroad and Phyllis was working for Mrs. Finney at the Newsy Nook. 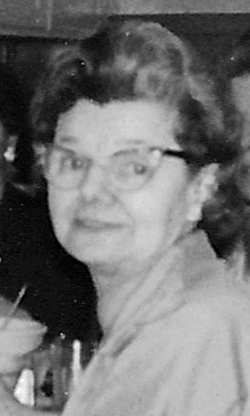 When Mrs. Finney retired, Phyllis stayed on to manage the shop which was sold to new owners. The Newsy Nook had the World-Herald Agency and there were a lot of carriers who delivered it to the homes of Chadron. Phyllis had to meet the train every morning to pick up the papers that came in from Omaha. The carriers came to the station platform to pick theirs up. She counted out each route. She enjoyed her work at the Newsy Nook. She loved the children, large and small that came in there -- even the ones that gave her a hard time. She very patiently waited on the kids that took a long time deciding how to spend their few pennies. If some of the big boys picked on the smaller children or any of the children started pushing and cutting up in the shop, this tiny little woman picked up a broom and chased them out. He brown eyes snapped and she wore a big smile while she was doing this, but the boys respected her authority and those same boys might be bringing her a small gift or compliment the next day. The kids all called her Mrs. Newsy. She watched the magazines that came in to be sure there was never any put on the rack that would be unsuitable for children to read. After Roy died in 1958, her time spent in the Newsy Nook became even more important to her. Her son, Jack, married Dorothy Petersen from Hay Springs and they have her three grandsons: Mike, Ron, and Dave Wagner. It was one of the saddest days of her life when she had to retire from her work at the Newsy Nook. Phyllis “Mrs. Newsy” Wagner died at the age of eighty, the day after Thanksgiving in 1974.